What to read after the Rainbow Magic Fairies? Last week a friend asked me for book suggestions for her daughter who loves the Rainbow Magic fairy books. She loves the fantasy aspect of the series, and the slim volumes that don’t intimidate her. But what could she read next? What should she move on to? It struck me that it’s probably a common question. The Rainbow Magic books are quite a phenomenon, with children lapping up the books and enjoying following a series. But there are so many beautifully written and illustrated books out there – so many wonderful new characters to meet and authors and illustrators to discover. So a quick look through the bookshelves and a lot of twitter chat later, here are some ideas that may help. I’ve split the books by type and in each section the books get progressively trickier to make it easier for you to judge which books will suit your children’s reading abilities. 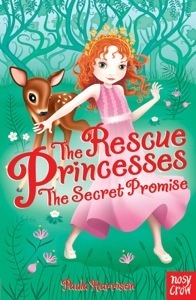 A fantastic series of books that shows children that princesses can be smart, independent and great role models. Think ninja-princesses working together and using magic jewels to rescue animals and help the environment. The book format is very similar to the Rainbow Fairy books with short chapters, lots of line-drawing illustrations to break up the text and confidence-boosting slim volumes. They will appeal to children who enjoy the fantasy of Rainbow Fairies while gently nudging children in a slightly more ‘girl-power’ direction. Plus bonus points for character diversity. Hurrah! 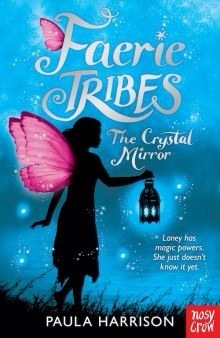 Paula Harrison’s Faerie Tribes series offers magic, mystery and excitement with a new quest at the heart of each book. The books are longer than The Rescue Princesses books and more advanced in language and structure. Meet Esme and her cast of weird and wonderful friends. Follow her wild and imaginative adventures as she leaves behind her circus home to spend the summer with her cousins. When hundreds of baby penguins hatch in Esme’s top floor bedroom, the children have to figure out how to get them outside. 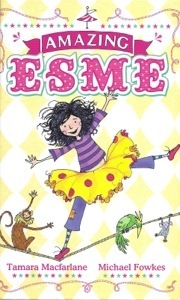 Esme and her cousin have the ingenious idea of building a helter skelter around the castle turret, but this is just the start – soon Maclinkey Castle is turned into a full-on Fairground Circus with a big wheel, Bumper Bears, and the show stopping Flying Tigers starring Esme herself! Amazing Esme is the first book in a series that celebrates the freedom to have adventures. Think Pippi Longstocking with a pirouetting donkey. The Esme books are well-written, short, easy to read, fast-paced and full of fun and adventure. Loads of illustrations throughout and follow on activity ideas at the back. 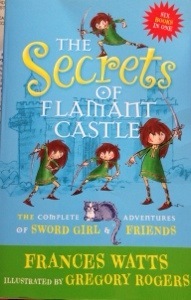 The complete adventures of Sword Girl and friends includes six books about Tommy, a kitchen girl at Flamant Castle. She dreams of becoming a knight and when she is made the Keeper of the Blades, caring for all the swords in the castle, it seems like her dream might come true. Fun stories about standing up for yourself and following your dreams. Tommy is a great role model with a team of fun characters -like Lil the talking cat and the ghost of a young squire. Short chapters and large text, the book itself is large as it has all six volumes in one, but each individual story is only about 80 pages long. Sally Gardner’s Magical Children (Orion) series is a collection of six books about children with magic powers. Well written stories about ordinary children with extraordinary powers, these books use magical adventures to look at real life problems that children might face – like absent parents, bullying, friendship problems and finding the bravery needed to follow your dreams. Large text, slim volumes with some illustration. After the Magical Children series, children who are comfortable reading independently could try Sally Gardner’s Wings & Co. fairy detective agency books (Orion). Operation Bunny is the first in the series. 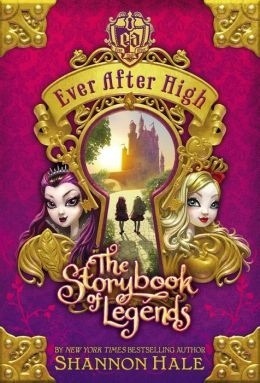 When Emily Vole inherits an abandoned shop, she discovers a magical world she never knew existed. But a fairy-hating witch, a mischievous set of golden keys, and a train full of brightly coloured bunnies are just a few of the surprises that come with it. 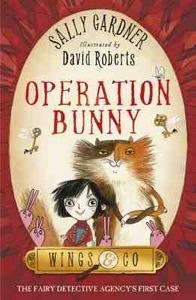 With the help of a talking cat called Fidget and a grumpy fairy detective called Buster, it’s up to Emily to get to the bottom of Operation Bunny. Brilliantly written by Gardner, and exquisitely illustrated by David Roberts, these are longer books (180 pages in Operation Bunny) with smaller text. The wide line gaps and short chapters (about 6 pages each) which are broken up by a couple of illustrations per chapter, make these books excellent stepping stones towards longer novels. 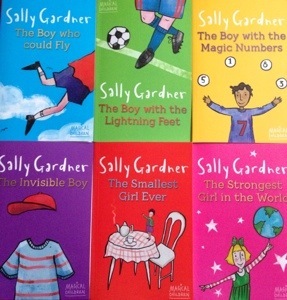 Sally Gardner’s books are beautifully gender-stereotype-free with positive characters and strong role models aplenty. Large format paperbacks, with large text and illustrations throughout, children who can read the Rainbow Magic books independently will be comfortable with these. This is the first in a series of books about a girl called Madeleine who works for her horrid uncle. 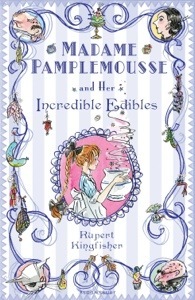 She discovers Madame Pamplemousse’s shop selling the strangest, rarest and most delicious edibles in the whole world. Madeleine joins forces with Madame Pamplemousse and Camembert the cat in a magical adventure to protect the incredible edibles from her uncle. These are slim and sparkly volumes with large text and line drawings throughout. One day Izzy and her friends are surprised to find that their teacher, Miss Jones, is actually being nice to them. This is the woman who was caught secretly smiling when Maisie Miller fell off her chair. There can only be one conclusion: she’s been taken over by aliens, and now she wants to make them all aliens too! 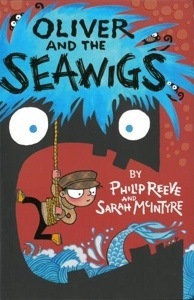 A very funny book with large type and fast paced writing that will have children racing through to the end. Lots of illustrations at the edges of pages throughout to break up the text. More confident readers who are ready to read a longer novel may like Witchworld. 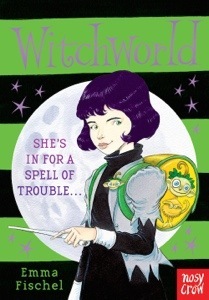 A contemporary witch school story, Witchworld tells the story of Flo, a thoroughly modern witchgirl. She has a spellstick, travels about in her skyrider and wouldn’t know a cauldron if she fell into one. 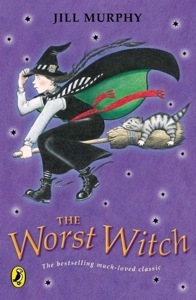 But when her grandmother turns up on an actual broomstick, warning that ghouls are about to attach Witchworld, Flo realises everything she’s been told about being a witch is just hocus pocus. A very funny story, this is the first book in the Witchworld series. This is a full sized novel with smaller type and no illustrations to break up the text, although it does have character illustrations by Chris Riddell at the start – and a gorgeous bright green edging. 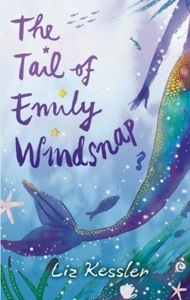 The Tail of Emily Windsnap by Liz Kessler (Orion) is the first in a series of books centred around mermaids, friendship and family. Emily Windsnap lives on a boat, but her mother has always been oddly anxious to keep her out of the water. It is only when Emily has her first school swimming lesson that she discovers why: as soon as she gets into the water, she grows a tail! Great writing and a very collectible series, these are longer books for confident readers. 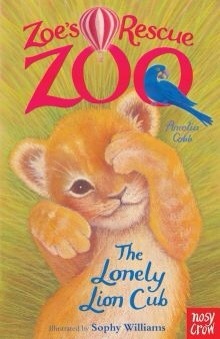 The Zoe’s Rescue Zoo books follow Zoe’s adventures living at her uncle’s very special zoo. He travels the world rescuing animals and bringing them back to the zoo to be nurtured back to health. It’s Zoe’s job to help them settle in and she has a secret that helps her – she can talk to the animals! Each book in the series focuses on a new animal. The reading level is very similar to The Rainbow Fairies books – slim volumes, beautiful illustrations, large text and short chapters. A magical winter’s tale about a very special friendship, perfect for Christmas. Lucy has a big secret . . . Santa’s left her a little reindeer in the garden shed! But Starlight is poorly, and Santa won’t be able to deliver any presents if he’s not well in time. 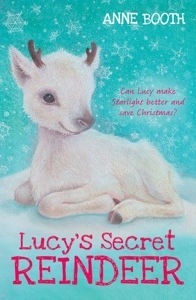 Can Lucy make Starlight better and save Christmas? This is a beautiful book with a gentle tone that children will love to read independently. A slim volume with large text and illustrations throughout. For more advanced readers, try Julia Green’s animal books. Seal Island follows the adventures of Grace as she spends her holidays with Granny at her house by the sea. Grace makes friends with local boy Col who knows the secrets of the island. When Grace discovers a small seal pup separated from its mother after a storm, she’s not sure if she can help it, but she has to try. A great step between small novels and full sized ones, this book is a slim volume but with smaller print and very few illustrations. Julia Green has written more animal stories for children to collect and would make a wonderful step towards the Gill Lewis animal books. The Girls FC series by Helena Pielichaty (Walker) is a highly collectible and beautifully inclusive series about a girls’ under 11s football team. 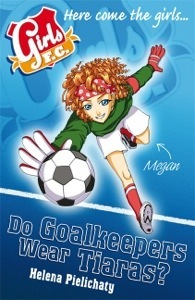 The first book in the series, Do Goalkeepers Wear Tiaras? introduces Megan and how wearing a tiara and fairy wings to football practice led to her starting her own, brilliant girls’ football team. The Daisy books by Kes Gray (Random House) are genius! They are riotously funny and Daisy is a fantastic character; smart, articulate, full of imagination, creativity…and mischief! The books really celebrate childhood and show children being children. Children may have already come across her in picture books such as Super Daisy And Eat Your Peas. Once children are reading independently the Daisy and the Trouble With… series are perfect books to engage children and boost their reading confidence. These books are a similar reading level as the Rainbow Fairy books, with larger text and short chapters, lots of illustrations and fast paced story lines. The language used is simple but the books themselves are thicker volumes, which will help build confidence and take away the fear of picking up a big book. The Daisy and the Trouble With… books work as stand-alones and can be read in any order. Susie Day’s Pea books (Random House) are full of fantastic characters, wonderfully written, fast-paced, and beautifully inclusive works of joy. 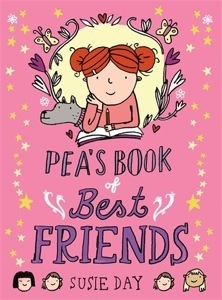 Pea’s Book of Best Friends is the first in the series. Pea has just moved to London with her mum, her (sometimes annoying) sisters, and Wuffly the dog. She sets out to find a new Best Friend…but it proves to be harder than it sounds. If you want your children to read about characters who are beautifully real and flawed and intriguing, then this is the set for you. I can’t rave about them enough! These books are a step up from the Rainbow Magic books and are best suited to confidently independent readers. 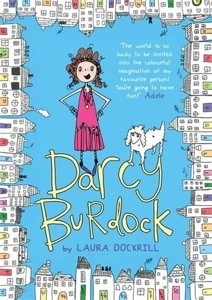 Laura Dockrill’s Darcy Burdock books (Random House) are the perfect follow on from Susie Day’s Pea books. They share the same energy, humour and pace and they are very similar in size and format. Ten-year-old Darcy Burdock is one of life’s noticers. Curious, smart-as-a-whip, funny and fiercely loyal, she sees the extraordinary in the everyday and the wonder in the world around her. Darcy is a great character to grow up with. 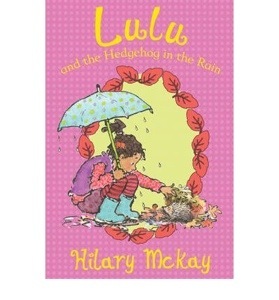 If you are looking for fantastic writing (and who isn’t) Hilary McKay is the author to head for. Flawless and inspiring writing, brilliant characters, great role models and stories that will engage and excite. 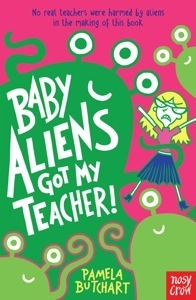 You could start with her Lulu stories (Scholastic). Short chapters, slim volumes and illustrations throughout make these lovely books for newly independent readers. For older/more advanced readers try Binny for Short or The Casson Family stories, starting with Saffy’s Angel. Jacqueline Wilson is a hugely prolific author whose books offer a huge variety of characters and story lines. Her skill is in portraying real families and children dealing with real-to-life situations. 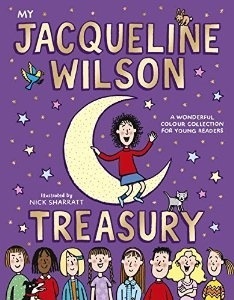 The Jacqueline Wilson Treasury (Random House) is a full colour illustrated book that includes some of her stories suitable for younger readers and is the perfect introduction to her work. 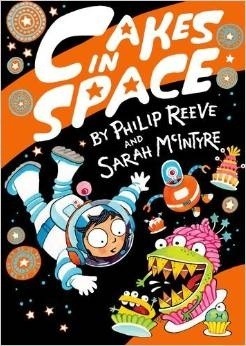 Oliver and the Seawigs and Cakes in Space by Philip Reeve and Sarah McIntyre (Oxford) are stunning books. 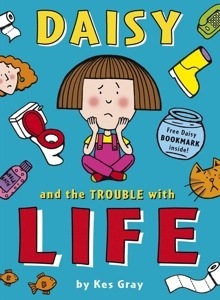 Highly illustrated throughout by Sarah McIntyre (Summer Reading Challenge 2014 illustrator) these books are laugh out loud funny masterpieces. Graphic novels offer fantastic storytelling in a highly illustrated format that can be easier for children to digest than their chapter book counterparts. Short stories in a comic book format with a super-heroine who has just moved to a new town. With mild peril and fairy tale twists, humour and modern issues, this is a great place to start. Hilda is sitting in her tent at night listening to the rumble of the storm passing overhead when she hears a bell. 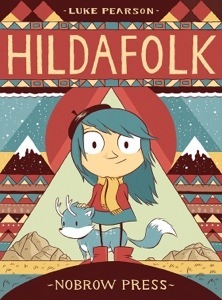 As she hurtles towards the vanishing tinkling sound, Hilda unwittingly embarks on an adventure into strange worlds ruled by magical forces. The start of a brilliantly contemporary graphic novel series. What would you add? Please let me know what books you and your children have enjoyed. Join in in the comments below. A huge thank you to my twitter crew who helped me out with some fantastic suggestions. Source: review copies of Esme and the Pirate Circus, Opal Plumstead, and The Secrets of Flamant Castle kindly sent by the publishers. All other copies my own or researched online. I was reading this and really enjoying all your recommendations and then got a lovely surprise to see you mentioned ‘Lucy’s Secret Reindeer’! Thank you so much. You’re very welcome. I have stashed it away for Mollie for her Christmas book tree. Can’t wait to see her unwrap it! These are fantastic suggestions! I saw the tag line “What to read after rainbow fairies” on twitter and clicked over because, well, I had a bunch of suggestions. You hit them all and then some! My girls loved those fairies so much we even themed a birthday party on them one year. (Details are on my blog) – but there comes a day when you’ve had enough. We loved moving to Rescue Princesses , but also embraced more realistic fiction like Clementine , Judy Moody , and the A to Z Mysteries next. 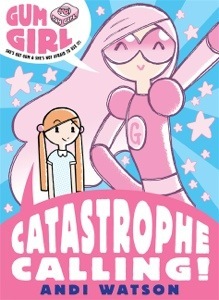 Other great fantasy series we’ve enjoyed: The Never Girls and Whatever After series. Thank you so much for including Nosy Crow books in this extensive and insightful list. Thank you so much for this wonderful and most helpful list. I have just reserved many of these books from the library and looking forward to sharing them with my daughter.